I know this is cutting it close to game time but last night I finally decided what we are going to serve at our Super Bowl party tonight. Here’s the links in case you need a last minute recipe. Today I’m using a Pillsbury crust. I’m adding Daiya mozzarella shreds today though. Usually I make it cheese less. I’m using the directions on the bag of frozen chicken wings and baking them for an hour. I’m going to toss the wings in some safe melted margarine & Frank’s Red Hot Sauce. I’m seasoning some with olive oil and salt. Some of the popcorn will be seasoned with this new recipe: “cheesy ranch” popcorn. The only changes I’ll make are sub nutritional yeast flakes for the parmesan cheese. This was inspired by a photo that was shared on Facebook from Kids with Foods Allergies Foundation. I melted some Enjoy Life chocolate chips with a dollop of shortening. Dip strawberries & place on parchment paper. Let the chocolate harden. Mix some powdered sugar with a little bit of water. I didn’t write out any measurements. Play with the thickness of the icing until it stays on the strawberry. You don’t want it to run off of the strawberry. 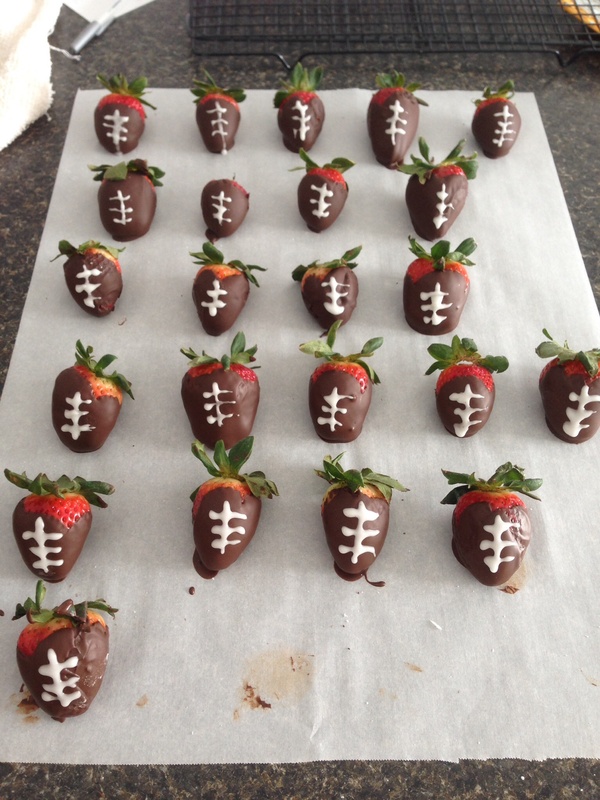 Pipe football design onto your strawberry. We are also going to have chips and salsa and some Oreos. I hope we all have a fun and SAFE Super Bowl Sunday! « Menu Planning My Way! Everything was delicious!!! So yummy!